Friday’s upbeat payrolls and wage growth figure along with the employment data supported USD against EUR. 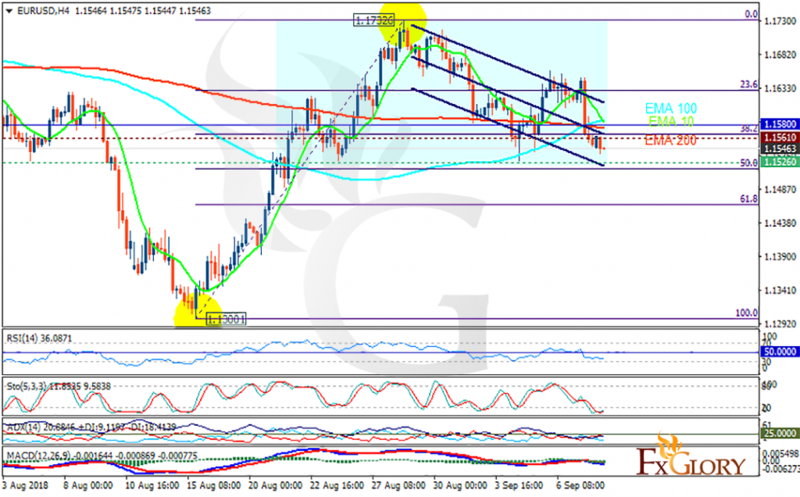 The support rests at 1.15260 with resistance at 1.15610 which the weekly pivot point at 1.16410 is located in between the lines. The EMA of 10 is moving with bearish bias in the descendant channel and it is above the EMA of 200 and below the EMA of 100. The RSI is moving in oversold area, the Stochastic is moving in low ranges and the MACD line is below the signal line in the negative territory. The ADX is showing sell signal. The chart has created a head and shoulder pattern therefore EURUSD will probably continue its downward trend towards 61.8 level of Fibonacci at 1.145.